"Bohemian Crown" redirects here. For the ceremonial objects, see Bohemian Crown Jewels. The joint rule of Corona regni Bohemiae was legally established by decree of King Charles I issued on 7 April 1348, on the foundation of the original Czech lands ruled by the Přemyslid dynasty until 1306. By linking the territories, the interconnection of crown lands thus no more belonged to a king or a dynasty but to the Bohemian monarchy itself, symbolically personalized by the Crown of Saint Wenceslas. During the reign of King Ferdinand I from 1526, the lands of the Bohemian Crown became a constituent part of the Habsburg Monarchy. Silesia was lost in mid-18th century. Later they passed to the Austrian Empire and the Cisleithanian half of Austria-Hungary. By the Czechoslovak declaration of independence in 1918, the remaining Czech lands became part of the First Czechoslovak Republic. The Bohemian Crown was neither a personal union nor a federation of equal members. Rather, the Kingdom of Bohemia had a higher status than the other incorporated constituent countries. There were only some common state institutions of the Bohemian Crown and they did not survive the centralization of the Habsburg Monarchy under Queen Maria Theresa in the 18th century. The most important of them was the Bohemian Court Chancellery which was united with the Austrian Chancellery in 1749. The Lands of the Bohemian Crown (Latin: Corona regni Bohemiae) are called země Koruny české or simply Koruna česká (Crown of Bohemia or Bohemian Crown) and České země (i.e. Czech lands) in Czech language, the adjective český referring to both "Bohemian" and "Czech". The German term Länder der Böhmischen Krone is likewise shortened to Böhmische Krone or Böhmische Kronländer. Native names include Silesian: Korana Czeskigo Krůlestwa, Lower Sorbian: zemje Českeje krony, and Upper Sorbian: kraje Čěskeje Króny. The denotation Lands of the Crown of Saint Wenceslas (země Koruny svatováclavské) refers to the Crown of Saint Wenceslas, part of the regalia of the Bohemian monarchs. For more detailed histories, see History of the Lands of the Bohemian Crown (1526–1648), History of the Lands of the Bohemian Crown (1648–1867), and History of the Lands of the Bohemian Crown (1867–1918). In the 10th and 11th century the Duchy of Bohemia, together with Moravia (the Margraviate of Moravia from 1182 on), and Kłodzko Land were consolidated under the ruling Přemyslid dynasty. Duke Ottokar I of Bohemia gained the hereditary royal title to the Duchy of Bohemia in 1198, from the German (anti)−king Philip of Swabia, for his support. Along with the title, Philip also raised the duchy to the Kingdom of Bohemia rank. The regality was ultimately confirmed by Philip's nephew the German king Frederick II, later the Holy Roman Emperor (1220−1250), in the Golden Bull of Sicily issued in 1212. The Přemyslid king Ottokar II of Bohemia acquired the Duchy of Austria in 1251, the Duchy of Styria in 1261, the Egerland in 1266, the Duchy of Carinthia with the March of Carniola and the Windic March in 1269 as well as the March of Friuli in 1272. His plans to turn Bohemia into the leading Imperial State were aborted by his Habsburg rival King Rudolph I of Germany, who seized his acquisitions and finally defeated him in the 1278 Battle on the Marchfeld. In 1306 the House of Luxembourg, began producing Bohemian kings upon the extinction of the Přemyslids. They significantly enlarged the Bohemian lands again, including when King John the Blind vassalized most Polish Piast dukes of Silesia. His suzerainty was acknowledged by the Polish king Casimir III the Great in the 1335 Treaty of Trentschin. John also achieved the enfeoffment with the Upper Lusatian lands of Bautzen (1319) and Görlitz (1329), by the German king Louis IV. Coats of arms of the Holy Roman Empire and the Bohemian Crown on the Tower of Charles Bridge in Prague. King John's eldest son Charles IV was elected King of the Romans in 1346 and succeeded his father as King of Bohemia in the same year. Charles IV created the Bohemian Crown, together with the incorporated provinces in 1348. The Luxembourg dynasty reached its high point, when Charles was crowned Holy Roman Emperor in 1355. By his Imperial authority he decreed that the united Bohemian lands should endure regardless of dynastic developments, even if the Luxembourgs should die out. In 1367 he purchased Lower Lusatia from his stepson Margrave Otto V of Brandenburg and the Margraviate of Brandenburg. Beside their home County of Luxembourg itself, the dynasty held further non-contiguous Imperial fiefs in the Low Countries, such as: the Duchy of Brabant and Duchy of Limburg, acquired through marriage by Charles' younger half-brother Wenceslaus of Luxembourg in 1355; as well as the Margraviate of Brandenburg purchased in 1373. As both the King of Bohemia and the Margrave of Brandenburg had been designated Prince-electors in the Golden Bull of 1356, the Luxembourgs held two votes in the electoral college, securing the succession of Charles's son Wenceslaus in 1376. With King Wenceslaus, the decline of the Luxembourg dynasty began. He himself was deposed as King of the Romans in 1400. The Duchies of Brabant, Limburg (in 1406), and even Luxembourg itself (in 1411) were ceded to the French House of Valois-Burgundy; while the Margraviate of Brandenburg passed to the House of Hohenzollern (in 1415). Nevertheless, the joint rule of the Bohemian Lands outlived the Hussite Wars and the extinction of the Luxembourg male line upon the death of Emperor Sigismund in 1437. Vladislas II of the Jagiellon dynasty, son of the Polish king Casimir IV, was designated King of Bohemia in 1471, while the crown lands of Moravia, Silesia, and the Lusatias were occupied by rivaling King Matthias Corvinus of Hungary. In 1479 both kings signed the Treaty of Olomouc, whereby the unity of the Bohemian crown lands was officially retained unchanged and the monarchs appointed each other as sole heir. Upon the death of King Matthias in 1490, Vladislas ruled the Bohemian crown lands and the Kingdom of Hungary in personal union. When Vladislas' only son Louis was killed at the Battle of Mohács in 1526 ending the Jagiellon dynasty rule in Bohemia, a convention of Bohemian nobles elected his brother-in-law, the Habsburg archduke Ferdinand I of Austria, as the new king of the Bohemian crown lands. 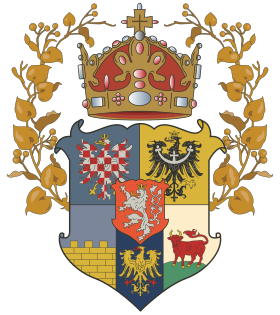 Together with the Archduchy of Austria "hereditary lands" and the Hungarian kingdom, they formed the Habsburg Monarchy, which in the following centuries grew out of the Holy Roman Empire into a separate European power. Attempts by the Bohemian Protestant Reformation estates to build up an autonomous confederation were dashed at the 1620 Battle of White Mountain, whereafter the administration was centralised at Vienna. Moreover, the Habsburg rulers lost the Lusatias to the Electorate of Saxony in the 1635 Peace of Prague, and also most of Silesia with Kladsko to King Frederick II of Prussia in the 1742 Treaty of Breslau. In the Modern era, the remaining crown lands of Bohemia, Moravia and Austrian Silesia became constituent parts of the Austrian Empire in 1804, and later the Cisleithanian half of Austria-Hungary in 1867. After World War I and the dissolution of the Austro-Hungarian monarchy, these became the historic regions usually referred to as the Czech lands forming the Czech Republic. Austrian Silesia with the Hlučín Region is today known as Czech Silesia, with the exception of eastern Cieszyn Silesia which passed to the Second Polish Republic in 1920. Lutheran Royal dignity first bestowed upon Vratislaus II of Bohemia in 1085, hereditary since 1198 under King Ottokar I; Electorate of the Holy Roman Empire, confirmed by the Golden Bull of 1356. Included the Imperial domain of Egerland (Chebsko), obtained by King Wenceslaus II between 1291–1305, definitely given in pawn to Bohemia by King Louis IV in 1322 and subsequently ruled in personal union with Bohemia proper; as well as the County of Kladsko, established in 1459 and conquered by the Prussian king Frederick the Great in 1742. Lutheran Principalities of Olomouc, Brno and Znojmo, acquired by Přemyslid and Slavník Bohemian rulers after the 955 Battle of Lechfeld, lost in 999 to Poland and reconquered by Duke Bretislaus I in 1035. Elevated to a margraviate by the Přemyslid dukes in 1182, Bohemian fief from 1197. Lutheran Many various duchies, acquired by the 1335 Treaty of Trentschin between King John of Bohemia and King Casimir III of Poland. The Habsburg queen Maria Theresa lost Silesia in 1742 to the Prussian king Frederick the Great by the Treaty of Breslau, with the exception of its South-East part which became called Austrian Silesia (later Czech Silesia). Today divided between Poland, the Czech Republic, and Germany. Lutheran Former Milceni lands of Meissen, finally incorporated by King John of Bohemia in 1319 (Bautzen) and 1329 (Görlitz). The Habsburg emperor Ferdinand II of Habsburg lost the Lusatias to the Electorate of Saxony with the 1635 Peace of Prague. Formally part of the Crown of Bohemia until 1815, today divided between Germany and Poland. Sorbs Lutheran Former March of Lusatia, acquired by Emperor Charles IV from Margrave Otto V of Brandenburg in 1367. The Habsburg emperor Ferdinand II of Habsburg lost the Lusatias to the Electorate of Saxony with the 1635 Peace of Prague. Formally part of the Crown of Bohemia between until 1815, today divided between Germany and Poland. The Brandenburg Electorate, acquired by Charles IV from Margrave Otto V in 1373. Charles' son Sigismund lost Brandenburg in 1415 to Frederick I, Elector of Brandenburg. The adjacent northern part of the Upper Palatinate ("Bohemian Palatinate") at Sulzbach, incorporated by Charles IV in 1355. Charles' son Wenceslaus lost the area in 1401 to the Electorate of the Palatinate under King Ruprecht of Germany. ^ "The Archives of the Crown of Bohemia". National Archive of the Czech Republic (Národní archiv ČR). Retrieved 6 June 2014. ^ Teich, Mikuláš, ed. (1998). Bohemia in history (1. publ. ed.). Cambridge: Cambridge University Press. p. 117. ISBN 0-521-43155-7. ^ "Silesia – Pearl in the Crown of Bohemia". National Gallery in Prague (Národní galerie v Praze). Retrieved 6 June 2014. ^ a b c Prinz, Friedrich (1993). Deutsche Geschichte in Osten Europas: Böhmen und Mähren (in German). Berlin: Wolf Jobst Siedler Verlag GmbH. p. 381. ISBN 3-88680-200-0. Retrieved 25 February 2013. This page was last edited on 5 March 2019, at 00:36 (UTC).